Just in case you were hiding under a rock this week, here’s some news for you. 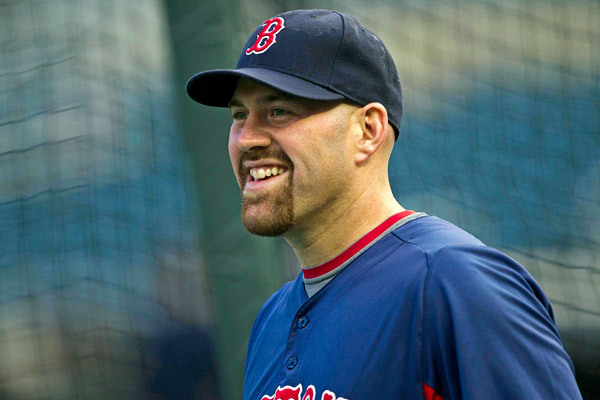 Former Red Sox legend (I think it’s safe to say that) Kevin Youkilis will be shaving his goatee off and donning pinstripes for the 2013 MLB season. That’s right. Youkilis is becoming a Yankee. Bands of angry Red Sox fans roaming the net holding virtual vomiting contests to see who can claim the greatest distaste at the news. Packs of angry Yankee fans flexing their spray tanned muscles roaring at each other in a contest to see who is the most outraged at this signing. The veritable landslides of virtual ignominy don’t change two simple facts. Firstly, Kevin Youkilis must be applauded at every at bat in Fenway Park. If any so called Red Sox fan spends a half a second even thinking about booing Youk, that same so called fan should be ejected from the park immediately. Preferably violently, or at least in humiliating fashion. Seriously, if you are at Fenway and you are standing beside someone who boos Kevin Youkilis on his return to Fenway, you have my permission to sucker punch them in the side of the head. There better not be one single solitary ‘boo’ when Youk comes to town. Seriously. Secondly, on the plus side of the equation, this is the Yankees doing what the Yankees do. Signing high priced, ageing veterans. In this case, they are signing a high priced, ageing veteran to replace (at least temporarily) another high priced, ageing and also breaking-down veteran (Gee, gosh, I wonder, why on earth is A-Fraud breaking down before our very eyes?! What could it be!?). Until Josh Hamilton signed with Anaheim for eleventy gazillion dollars (and substance abuse rehab centers across Anaheim held wild celebrations) the Youk signing was the big MLB news of the week. In actual fact, it wasn’t that big a deal. For the Sox, nothing should change, Youkilis should always be cheered at every single at bat at Fenway ever. For the Yankees, it’s just Yankees being Yankees, signing old players for a lot of money and then acting shocked when all their hamstrings break and they have no money left to sign more fat old players. Now, let’s all enjoy some actual real comments from actual real Yankee message boards. Looks like New York will be welcoming Youk to town with open, cuddling, warm, charming and loving arms, as only New York can.